Below the next picture are two excerpts from the 25-inch OS Map. they show two consecutive lengths of the ECMR. 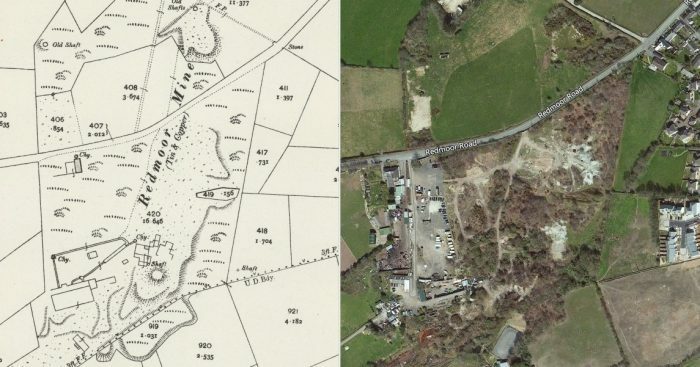 The first has Incline Station at the bottom and the second takes us through Drakewalls (later Gunnislake) to the junction which served Pearson’s Quarry.Not visible on either of these two maps is the village of Albaston nor the hamlet of Drakewalls, both of which were to the West of the line. The next mine encountered, Drakewalls Mine, produced mainly tin, also some copper, wolfram, arsenic, molybdenum, lead, & silver, originally from a long “gunnis” or open cutting. Hence the later name of the station near the mine which was named after the village of Gunnislake. The mine was worked from the 11th Century to 1905 (also 1909-10), with periods of closure. The image above is taken looking back down the line of the ECMR towards Incline Station, the picture comes from Google Streetview. The following photograph was taken in the early part of the 21st Century and shows the derelict buildings of the mine.The route of the ECMR is shown above in the left half of the sketch map. Caltock Consols, Drakewalls are also shown along the route of the line. 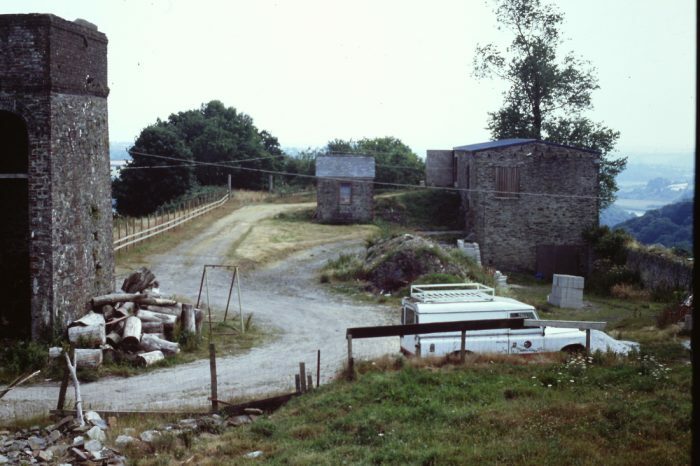 The newly constructed Gunnislake Station in 1994. The picture is taken from the A390, (c) Roger Winnen. 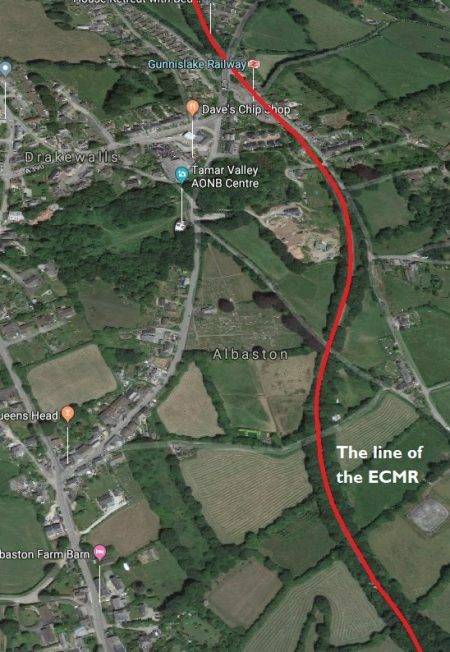 The picture above is a Google Streetview image, taken looking North, of the end of the modern branch-line at Gunnislake, just before the old track-bed reached the modern A390 which is in the trees ahead. 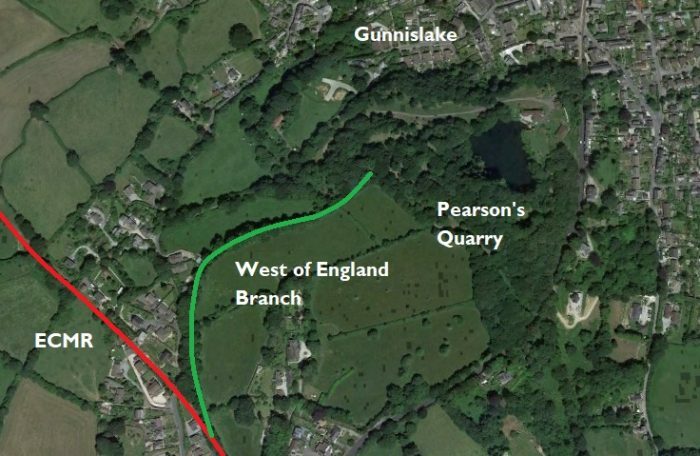 The adjacent map shows the A390 and the junction with the West of England siding to Pearson’s Quarry. 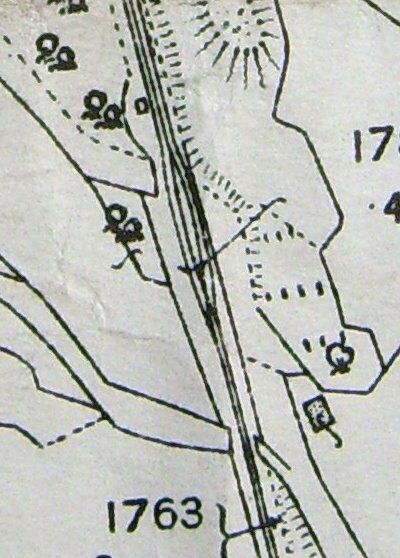 The next road to cross the old line is now called Station Road and can be seen on the adjacent map just to the north of the branch to Pearson’s Quarry. 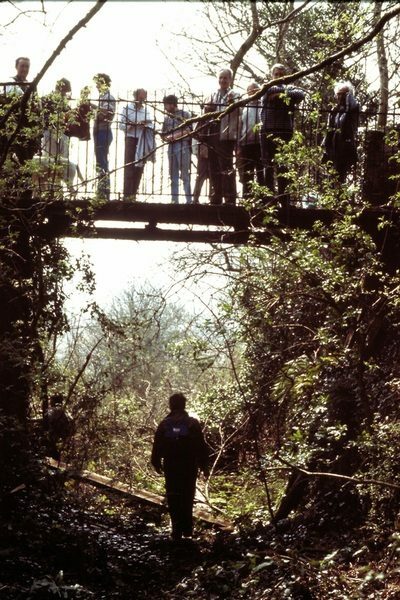 The bridge appears below.Station Road bridge had sheet metal parapets. 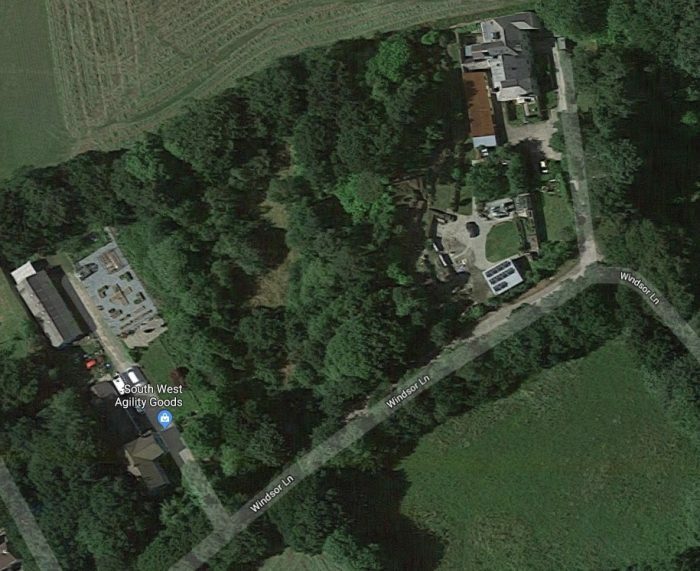 It sat just north of the junction with a branch-line to Pearson’s Quarry which headed off beyond the trees on the right of this Google Streetview image. The Lake on the modern satellite image above locates Pearson’s Quarry close to the village of Gunnislake. The route of ECMR is shown in red. The route of the branch-line is shown in Green. 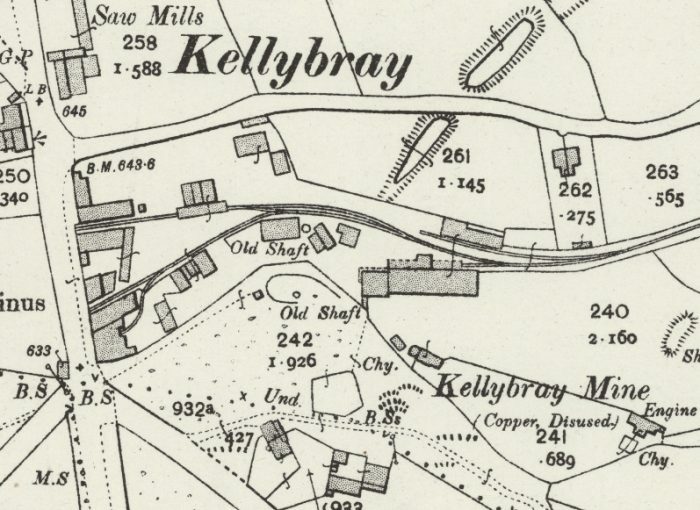 The next map excerpt from the 25-inch OS Map shows the route of the line in 1906. 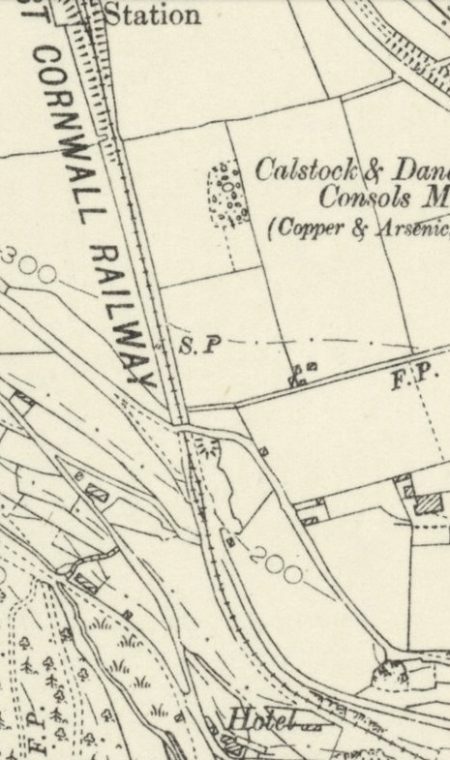 As it passes Greenhill Arsenic Works two branches leave the line to the North and East. The first fed Plymouth Works in North Dimson and is seen in full on the 25-inch map below. 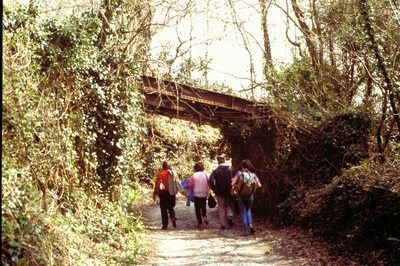 The second was a tramway which served Gunnislake Clitters Mine.The Greenhill Works was a combined Arsenic, Brick and Chemical Works. It was built in 1875 closing very soon after due to financial difficulties. However it was taken over in 1882 by Gunnislake Clitters mine. 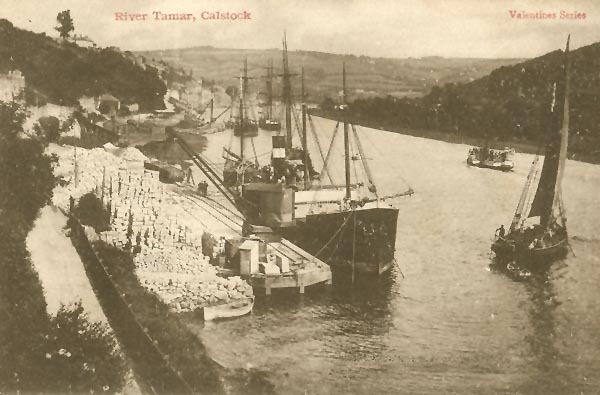 At the beginning of the 20th Century it was treating ore from several local mines including the Tavistock mines. The date of closure is uncertain but it is believed to be 1823 but other sources say the plant was still at work until the 1930’s. 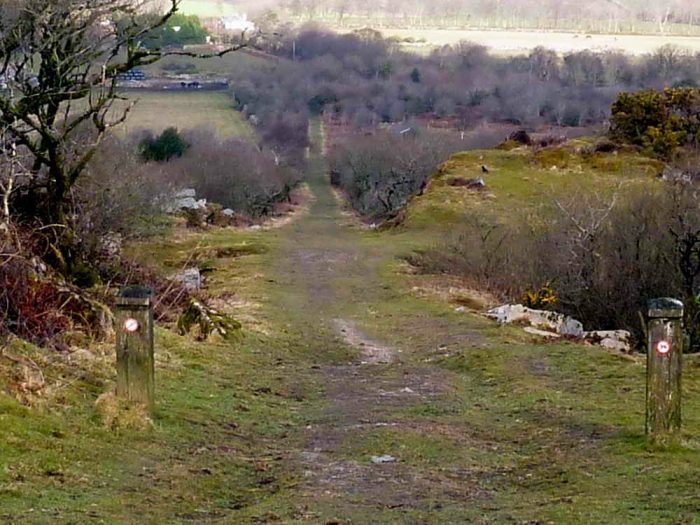 The site remains are quite extensive with some abandoned buildings and blackened burnt tailings between the railway and the Chilsworthy road at North Dimson, Gunnislake (opposite the Clitters Engine Houses). Further along the Chilsworthy road up on the right are some old building in use as industrial premises and most of all the Arsenic stack (flues mostly gone) which stands at just under 200 ft tall, originally this was 212 ft tall but the top 12 feet were blown off by lightening in 1989! Greenhill Arsenic and Brick Works in December 2010 are shown above in a Google Streetview image. The main chimney at the works, shown in the adjacent image taken at around the same time was hit by lightning in 1989. A narrow road to Latchley drops away from the Delaware Road above the line and originally ducked under the line via a bridge with stone abutments and a steel span. Only the abutments remain.The photograph above looks back along the line at Hingston Down Farm. There was a halt here when the line was active and single short siding alongside the house. The Halt was called Latchley after the nearby village. The location is shown on the 25-inch OS Map in the adjacent image. Latchkey Halt had a single platform on the Down side of the running line, which was recorded in 1908 as being 220′ long. Immediately west of the platform the railway crossed the minor road from which the modern pictures are taken by an un-gated level-crossing. 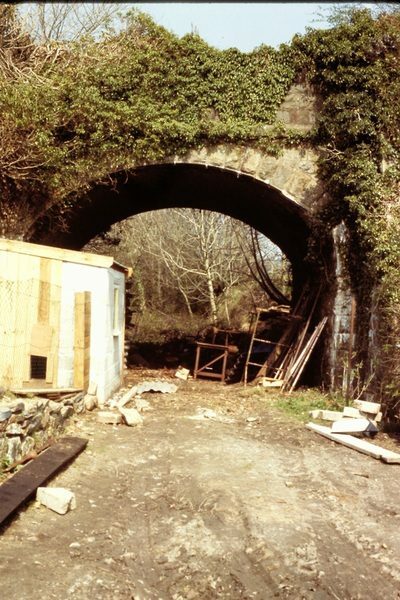 There was a siding on the Up side opposite the platform, which was accessed by a connection facing to Down trains at the Gunnislake end of the station. A small loading platform was located between the main line and siding in front of the main platform and opposite this again outside the siding was the stationmaster’s house and ex-ECMR goods shed. The siding was removed at some unknown date after 1950 and the station itself was closed on 5th November 1966. The station house and track-bed are now in private ownership. 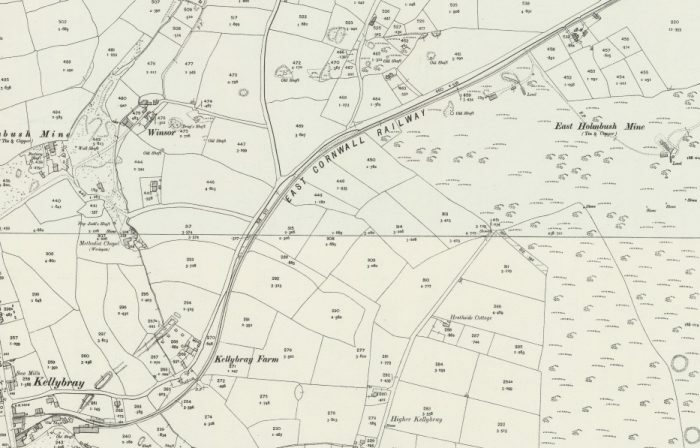 The next image looks West from the same lane.The next places of interest on the 25-inch OS Map from 1906 are shown below. 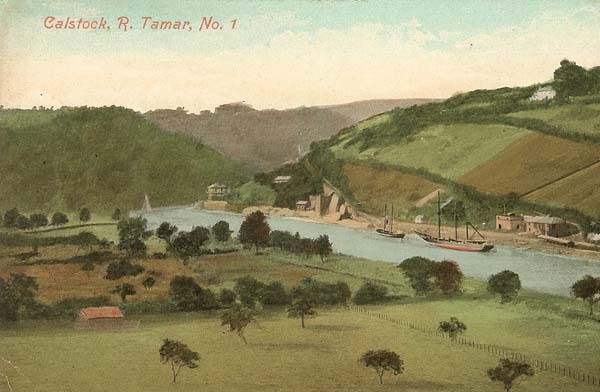 The Tamar Works were operational in 1906, the Phoenix Works were closed at that time.The Tamar Works site is now a static caravan park (Tamar Park). The Phoenix Works has completely disappeared but the quarry at rail-side just beyond the works can still be seen on satellite images.Looking back along the line to the East.The Phoenix Works would have abutted the railway fence on the right-hand side of the image. The was a short siding at this location. The Halt was known as Seven Stones Halt. It was just a simple platform on the Down side, which was opened in 1910 in order to serve the nearby Phoenix Pleasure Grounds. Sometimes it is referred to as Phoenix Mines Halt after the nearby mines, whose owners contributed to its cost. The halt was closed when the Pleasure Grounds shut during World War I, the date being given variously as 1914 or 1917. A later plan records the platform as being 140′ long. Part of the platform still remained in 2003 over 85 years since it was last used by passengers! Immediately west of the platform the railway crossed the minor road from which these two pictures are taken by an un-gated level-crossing. The same Halt in 1950 looking from the West. Looking ahead along the line to the West from the same position.The route of the line turns to the Northwest and passes to the North of Monkscross.The hamlet of Monkscross was served by the station which can be seen on the 25-inch map above. Very early in the life of the line the station was known as Monks Corner. 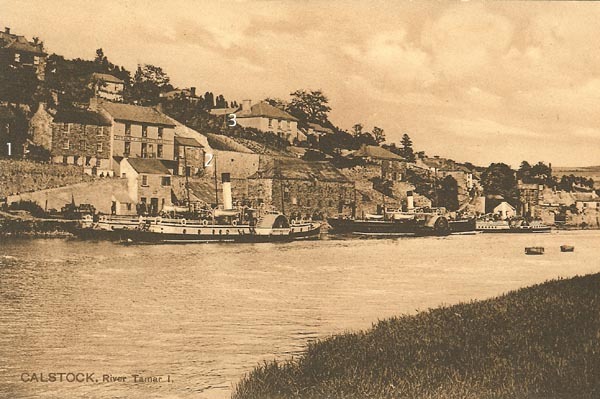 It was later known as Stoke Climsland and eventually as Luckett after the village some distance to the North and close to the River Tamar. 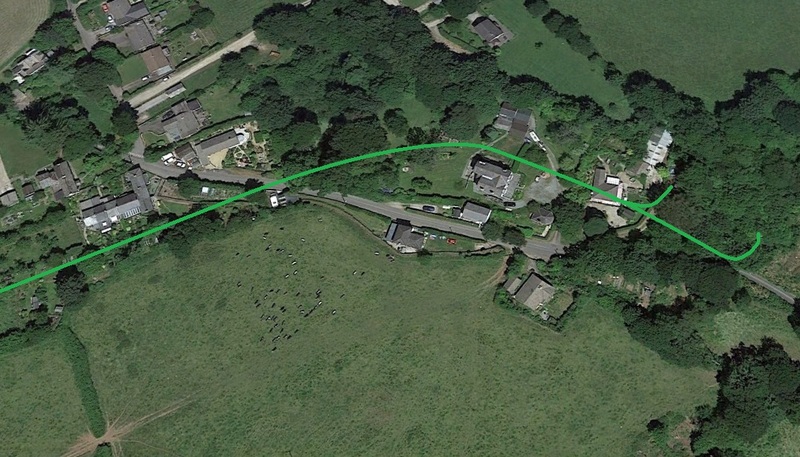 The station had a 225′ platform on the Down side and a loop siding opposite it on the Up side, with connections to the main line at both ends of the station, (although this does not appear to be the case on the 25-inch OS Map above). Immediately to the west of the station the line was crossed by the minor road from which the following pictures are taken, on a girder over-bridge. There was a further siding on the Down side at the Gunnislake end of the platform, with a connection that faced Up trains, and apparently this siding boasted a carriage shed for some years. 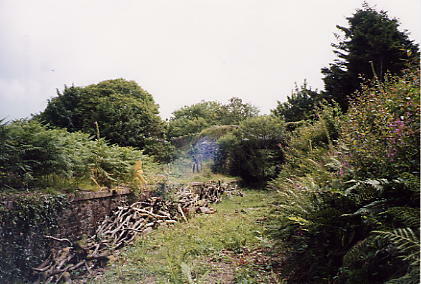 There was originally a small ground-level signal-box here on the Up side at the Callington end of the loop, but in 1923 this was reduced to a ground-frame. 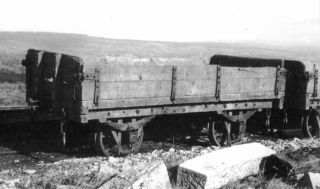 A separate small ground-frame worked the Gunnislake end of the loop siding. 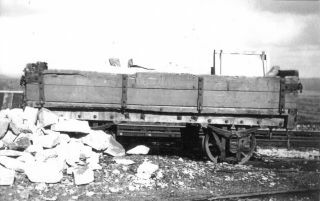 The carriage siding was taken out of use on 31st March 1923. The loop siding was taken out of use on 23rd September 1962 and the station itself was closed on 5th November 1966. The station house and track-bed are now in private ownership. Luckett Station from the road over-bridge, a Google Streetview image.The road over-bridge is shown above with the station off to the right of the picture. The railway line was in cutting to the West and that cutting has been filled in. 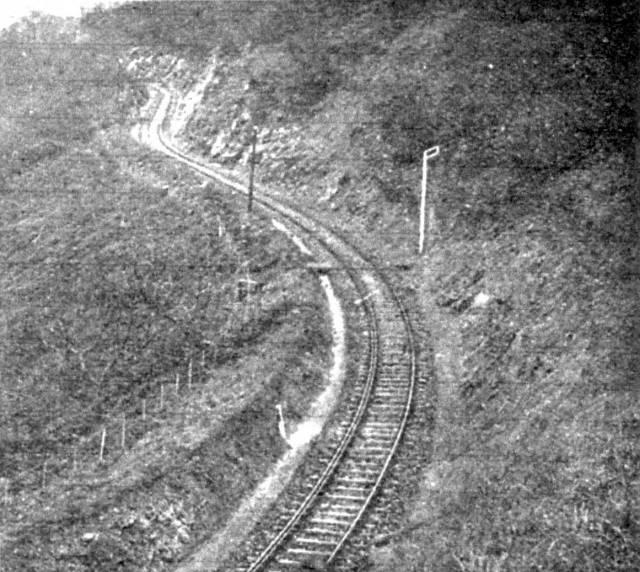 Beyond Monkscross the line curved gently round to a South-westerly direction and passed the Kit Hill Quarry Tramway shown below. 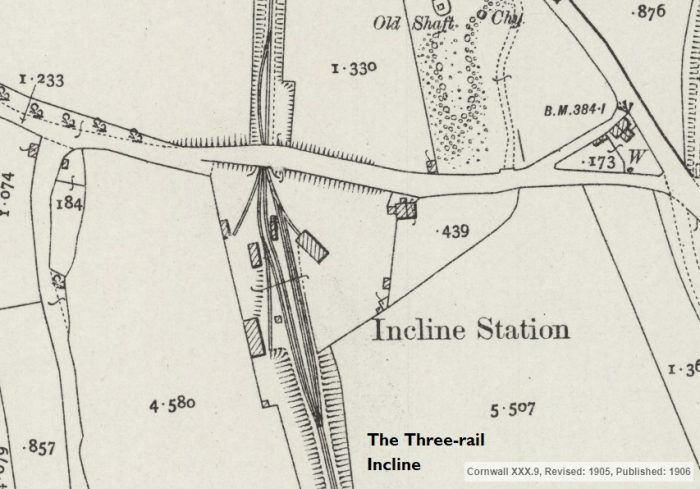 The Quarry was served by an incline from a small exchange facility next to the main line which consisted of a single siding off which branched the tramway incline. 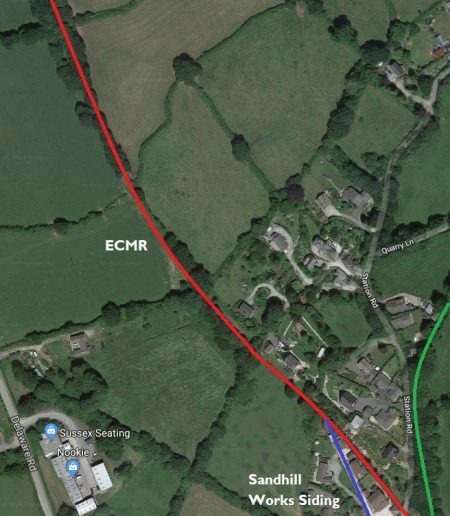 After leaving Calstock, the line begins a climb of 400 ft. to Gunnislake station, winding in and out curves of 6 chain radius. 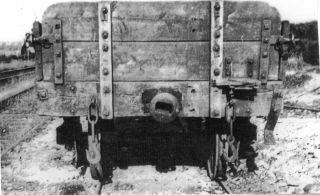 If seated in a rear carriage, a passenger can often see the 0-6-2 tank engine toiling with might and main on her way up the grade of 1 in 38 round some sharp curve. The above picture is a typical illustration of one of these curves. 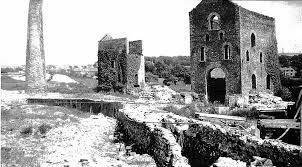 When all the mine and auxiliary buildings had been finished it was said that there was more masonry in Luckett than in Callington Itself. 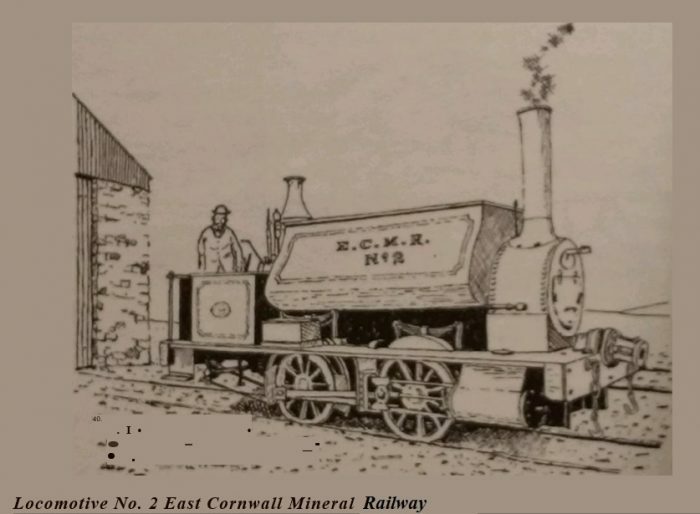 The company was using 400 tons of coal a month and it was proposed to lay in an inclined tram-road from Monk’s Corner on the East Cornwall Mineral line, then being constructed. In the village itself the company erected a large boarding-house to accommodate fifty miners, an earlier proposal having been to build thirty cottages for the same purpose. 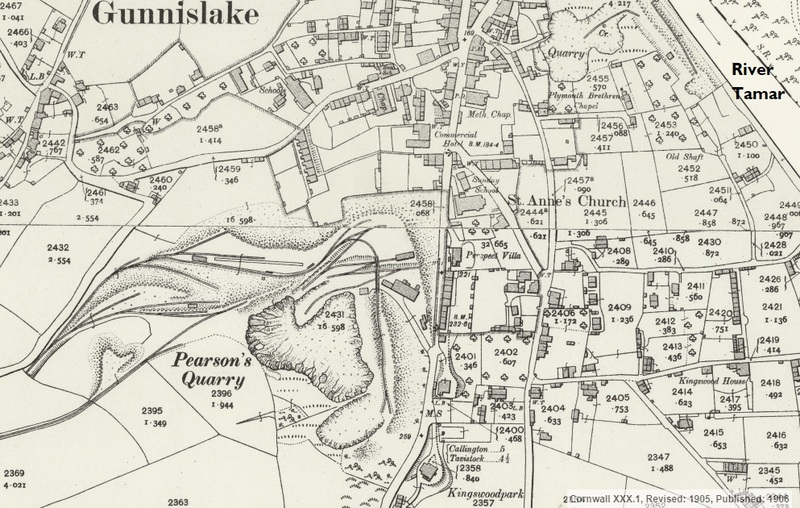 When major arsenic production started in 1872, the fumes did considerable damage to the adjoining fields and, it was claimed, to the local inhabitants as well, and as a result the mine was all but stopped for a time by an injunction on this account. 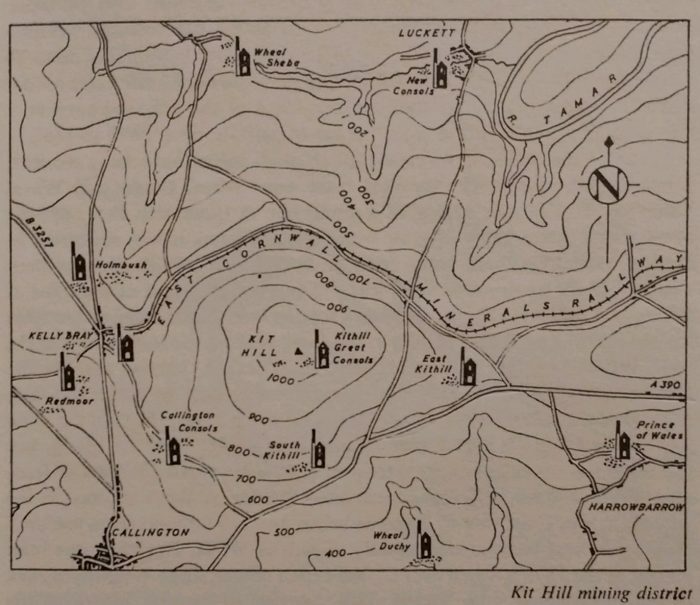 Kit Hill itself has been the scene of much sporadic underground activity, although mining there has never been successful on any large scale. Kit Hill Mine was re-started close to the summit of the hill in 1855 and was also known as Kithill United in 1859 when a 32-inch engine had been put in. 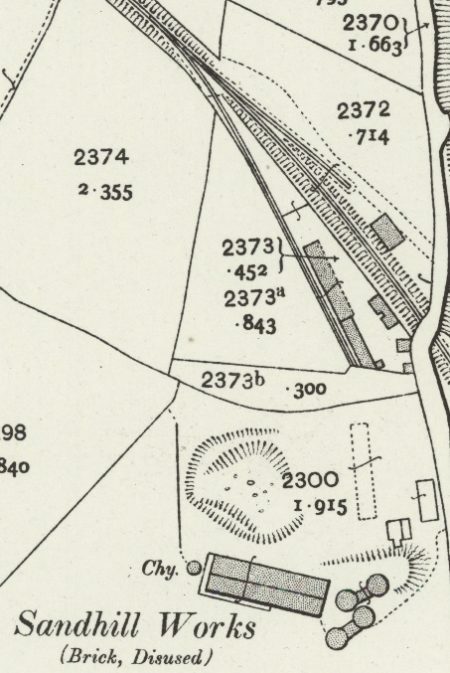 After having been idle for some time the sett was taken up in 1881 with the intention of sinking the existing engine shaft to a junction with a tunnel driven south under Kit Hill from Deer Park Wood. This latter had been started in 1877 by Kit Hill Tunnel Ltd., in the hopes of laying open two or three ‘champion’ lodes amongst the score or more that would be cut in its two mile length from north to south. The company also hoped for royalties as a result of use of the tunnel as an adit and haulage level by mines connecting with it—in similar fashion to the celebrated Sutro Tunnel then approaching completion in Nevada to assist in working the Comstock lode. The new company of 1881, as Kithill Great Consols. sank their engine shaft to 112 fathoms with the aid of a 30-inch rotary engine built by Messrs. Nicholls Williams. At the same time they re-started work in the tunnel with two Robey 16-inch semi-portable engines. Measuring eight feet square, it was driven for most of its distance in granite and proved quite dry. Progress however was both slow and expensive despite the use of rock-boring machines. 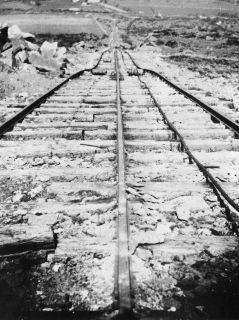 The ultimate intention was to lay a double line of tram-road operated by an endless wire-rope, but the work had come to a standstill before May 1885 when the company was wound up. Re-named the Excelsior Tunnel, driving was subsequently resumed on more than one occasion but only one good bunch of ore was ever encountered, yielding some £15,000 of tin in 1902-03. By 1911 it had still only been driven 350 fathoms, less than half the distance to the bottom of Kithill Engine Shaft. This has recently [before 1971] been the site of underground test explosions carried out in connection with Government research. Another similar tunnel has been driven almost half a mile into the southern side of Kit Hill, this being the other portal at which the original tunnel company also commenced operations in 1877. 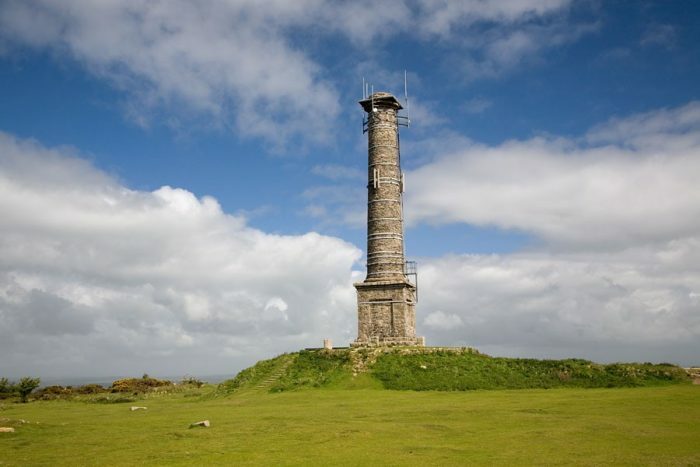 The eighty-five foot high stack that crowns the hill and forms such a conspicuous landmark in East Cornwall is a relic of Kit Hill Mine. 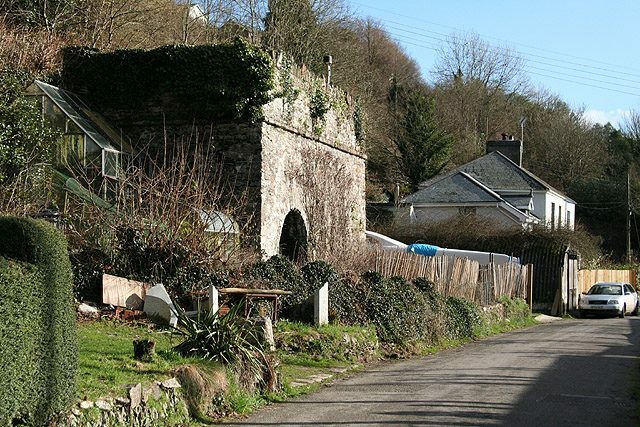 The boiler and engine-houses which flanked it still retained their roofs until after 1905 and the walls remained standing until about 1928, in which year the access road to the summit was opened to the public. The square pedestal base and lipped top of the stack are thought to have been ornamental features stipulated by the Duchy of Cornwall at the time of building in order that the structure might assume the appearance of a monument. It is now preserved by the Duchy, the top of the bore being sealed by concrete to keep the structure water-tight. The small East Kithill Mine was worked with Kithill United at one time, the tin-stone from Kithill Mine being stamped and dressed here in a period of activity after 1900. During the war, output from a considerable amount of surface prospecting and adit driving on the slopes of the hill was conveyed to Hingston Down by an aerial ropeway. This was 2½-miles long, on the monocable system, with a capacity of 15-20 tons per hour and worked by four men and four boys. The Duchy of Cornwall, working these mines during this period, employed considerable numbers, with 70 surface and 100 underground workers in 1918. 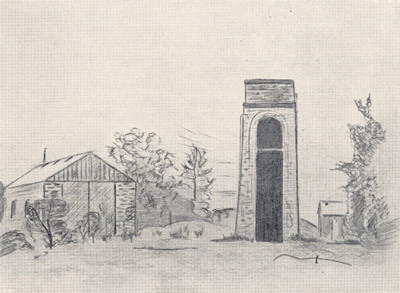 South Kithill was another small tin mine, situated on the southern slope of the hill, and sunk to a depth of 52 fathoms in the main period of activity from 1870 to 1883. A short distance farther east Prince of Wales Mine was re-started in 1861 in an area of ground that had been worked for tin and copper in a small way under a variety of names, to adit level (42 fathoms) or a little below. 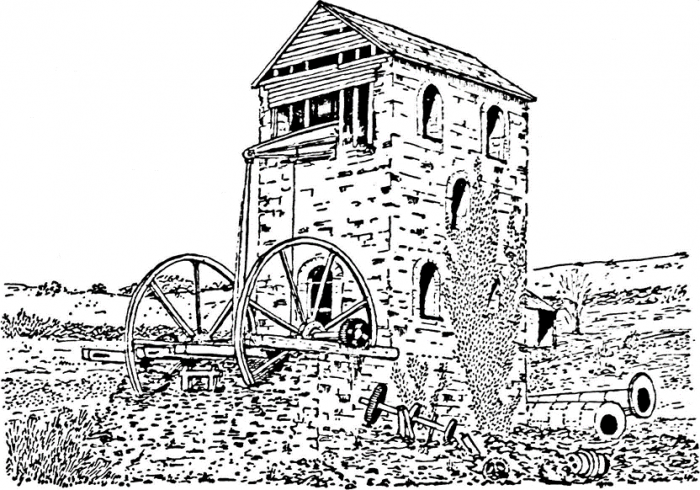 Working at first was aided only by a water-wheel but in 1864 when the shaft came into good ore ground at the 45 fathom level it was decided to erect an engine. By 1870 the mine was 75 fathoms deep and employed 120 persons. Some tin was then being returned and the following year stamps and other dressing machinery were erected but a few years later working was temporarily suspended, due to the existing small 25-inch engine which proved unable to keep the mine in fork. In 1879 a new company put in a50-inch engine and sinking re-commenced. The depth then was 90 fathoms and the mine came into tin at 102 fathoms depth, with the ground continuing tolerably rich as sinking continued. In 188, a second-hand engine and 36 head of stamps were put in and at this time the mine was also with a 24-inch steam whim. Two years later 148 were employed and in 1892 the company was re-constituted to limite liability in a vain endeavour to secure more working capital. After a short period of suspension during the worst of the tin depression a new company took up the mine and working continued until the outbreak of war, the depth of the mine at abandonment being 193 fathoms. 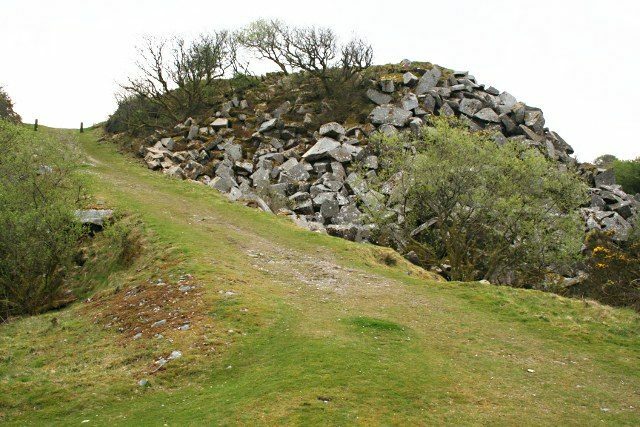 On the summit of the ridge, north of the A390 road, lay Hingston Down Consols, the main working of which commenced in 1846 for copper, the granite of Kingston Down having, been the scene of t mining activity as early as the seventeenth century. In 1850, rich copper was encountered at the 35 fathom level and considerable amounts of ore were sold throughout the rest of the decade. In 1864, the mine employed 225 persons, a number that had declined to 180 by 1876. Two years later the main workings, then 172 fathoms deep, were allowed to fill with water, with the machinery left in situ in the hopes of re-working in better times. Meantime, attention was turned to the western part of the sett and activity continued here on a small scale until 1885, when the company was wound up and all the materials sold off. 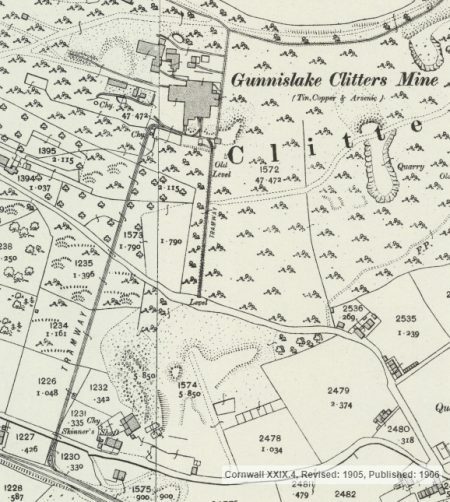 In 1910 the sett was taken over by Clitters United, which in the next four years treated the Hingston dumps as well as those of the old Greenhill Works. 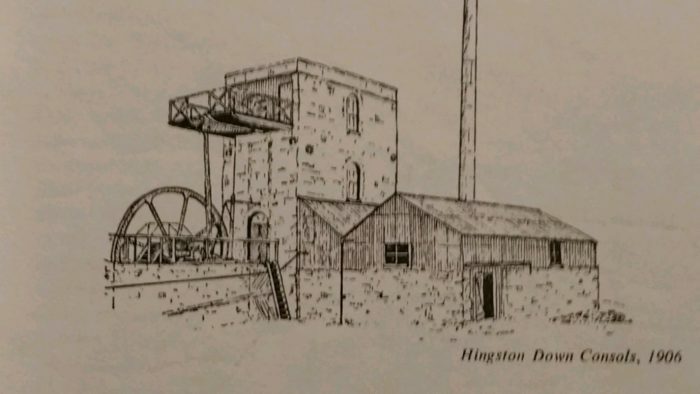 From 1905 onwards, Hingston itself was re-opened and a set of stamps was installed, driven by an engine that had formerly worked on Devon Great Consols. The company. however experienced continual trouble with other second-hand machinery and with the crookedness of the main shaft, and the mine again closed in 1908.